Concrete is a popular material for outdoor spaces. It is important that a surface is textured enough to make it safe against slips and falls, especially during wet and snowy weather. More often than not, when concrete is used, only a few tricks can be done to add a texture to its surface. There are paving materials that can be added to increase traction but not everyone can afford such an expensive option. The best solution? Spray Knockdown Texture Finish. Not only does it provide the slip-resistance needed to make outdoor spaces safe, it also enhances aesthetics, durability, and function. Let’s talk about texture in detail. 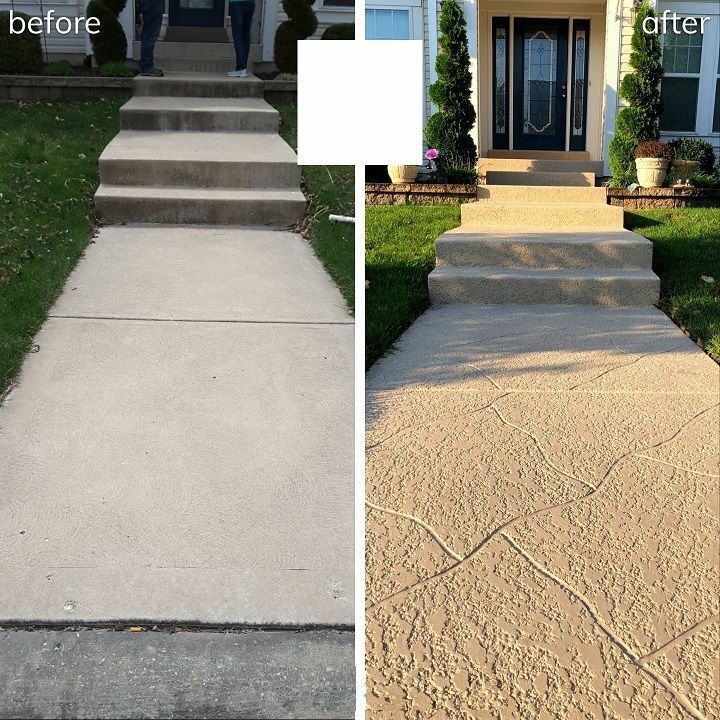 The end result of a knockdown texture on concrete is similar to stucco but with less intense grooves and elevations. It is rough enough to enhance grip but comfortable enough to walk barefoot on. When walking on a spray textured surface, the grooves on the surfaces help create air pockets, allowing air to circulate around the foot. Sounds quite technical and scientific but this means it keeps the surface cooler than most paving materials. This is one of the top reasons why it is ideal for outdoor surfaces, especially as a pool deck resurfacing option. Money is valuable and everyone wants to make sure that each investment they make is worthwhile. With a knock-down finish, you get the most benefits at a minimal cost. It is affordable but highly efficient, a combination rarely seen nowadays. This coating comes in a variety of colors. If you can’t find a hue you want, it can be stained to your desired color. Customization opportunities do not stop there. When dry, it can also be engraved or cut to create decorative scorelines or expansion joints. 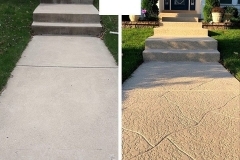 It can be customized to your liking with the use of concrete stains. Other options include engraving, adding scorelines, and expansion joints. 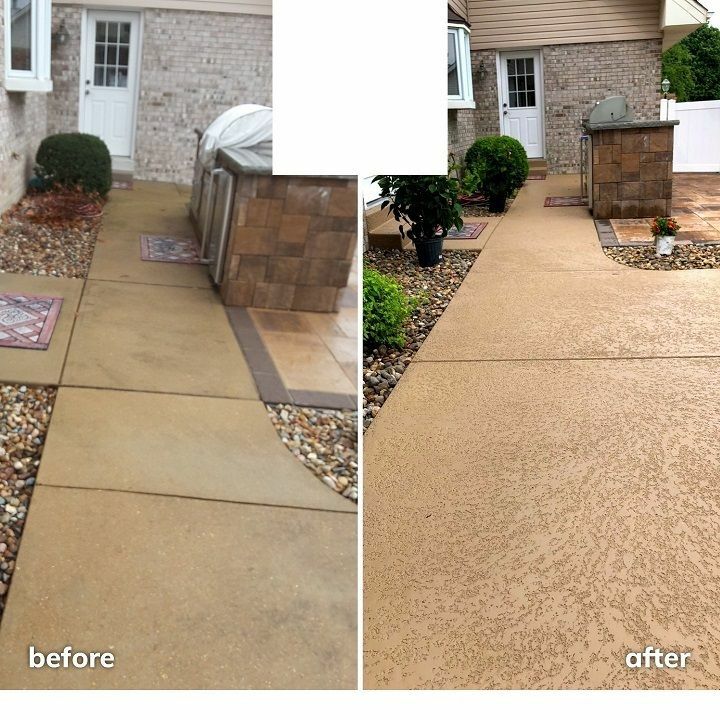 Aside from concrete pool decks, this coating can also be used on patios, driveways, walkways, front entryways, and other outdoor surfaces. 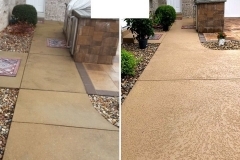 A spray knockdown finish is a more economical alternative to concrete replacement and the installation of high-end paving materials. However, there are several factors that could affect the total costs. One significant factor is space. Resurfacing a pool deck, the contractor must measure how many square feet of decking needs to undergo a spray texture installation. Customization will also cost extra, especially if it involves custom graphics and designs. The complexity of the design and the number of stain colors needed also play huge roles when it comes to cost. Walk safely with a Cool Deck Spray Texture Coating. Call (773)377-8976! When it comes to safety, Chicago Concrete Resurfacing is your partner. We care about the safety of our clients so we made sure our spray knockdown texture solution provides safer, more slip-resistant surfaces at an economical price. Our highly trained team have years of experienced spraying the material and knocking it down to a unique texture. Call or email us now and we’ll schedule you for an in-home consultation and price quotation, fast and free!